I never used to understand why people would make pot holders until I bought a lovely cast iron skillet. After years of using tea towels, scrunched up or oven gloves that always seemed to be so padded I ended up nearly dropping things, these little pieces of cloth are perfect! 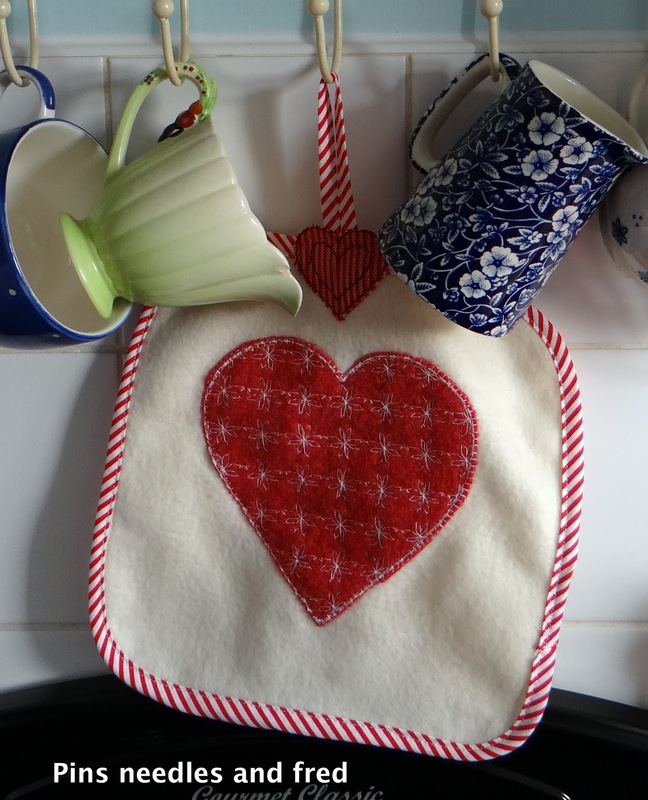 The heart is embroidered with a fancy machine stitch, I created it as a practise piece when I was trying to get to grips with my sewing machine and never really knew what to do with it. It was also another fad of dyed wool blanket which came out a beautiful thick consistency and a lovely christmassy red. I love the cosiness of the red and the white and the bias binding was a great ebay purchase all the way from Poland. I think they will be my latest fad, there are so many variations and designs out there and it is a small simple project to play with, far more manageable than a huge double quilt! With time so limited these days, I often just want to make something quick in the afternoon in the short time I have available, and these are ideal, I am sure I shall be adding to the list of pictures over time.